Your book “Lincoln’s Foreign Legion: The 39th New York Infantry, the Garibaldi Guard” is now available on Kindle. What brought you to investigate this type of topic? From my earliest memories to quite recently is that to be an Italian American can mean being commended with honor in one extreme or face deplorable rejection at the other extreme. I learned that the source of that public perception of Italian Americans was and continues to be fomented through the eyes of the media, by motion pictures, television and the news. Italian Americans have been experiencing macro and micro aggression for at least 120 years. The result is every Italian American experiences at some time in their private or public life an ephemeral bias directed toward them that has caused them to be overlooked, ignored, discounted, or singled out to be maltreated and even aggressively punished. Many years ago my grandmother’s brother gave me a book by the Italian American writer and researcher Giovanni Schiavo entitled “Four Centuries of Italian American History. “ This one book gave me a whole new look at how greatly Italians contributed to American history. This book is what prompted me to get to the truth, and then if the truth could be brought out that there would be change in public perception and attitudes toward Italian Americans. I believed I could prompt this change through writing and the cinema. Schiavo did some of his research at the Newberry Library of Chicago, so I began my search there. Using Schiavo’s book as a reference I began to look up all of the men and women he had written about. At the Newberry I discovered a treasure trove of information about them, the migration of Italians to America prior to the Civil War, where they settled, lived and how they participated in the events of American history, and in particular a regiment that participated in the Civil War, the “Garibaldi Guard.” Theirs was a story based in historic fact that was an exciting topic, a great deal of information on them was there ready to be looked at. Of course this information was not written in a series of book, or even one book, that it had to researched, assembled, and written, and I was the one who was going to write it. The result was the book “Lincoln’s Foreign Legion.” I always hoped this would influence the public to see Italian Americans in a new way. If it were adapted to a script, then produced as an epic motion picture it surely would have an impact and lead other creative people to create many more projects. Were you more interested in the subject as a New Yorker or as an Italian American? As an Italian American. I am not a New Yorker. 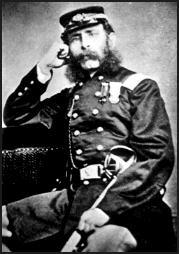 Could you give us a brief explanation of what the Garibaldi Guard was and why it was called that way? At the outbreak of the Civil War this regiment was a regiment of infantry assembled in New York City from the many immigrants living in their ethnic neighborhoods. There were ten companies of soldiers with 110 soldiers and officers in each company. There was an Italian, French, Spanish and Portuguese, Swiss, 2 companies of Slavs and Hungarians, and 4 companies of Germans. They saw action for all four years of the Civil War and fought from Bull Run 1861 to Appomattox 1865, in 50 battles, engagements and skirmishes which devastated the ranks and reduced their numbers. During its period of service, 5 officers and 62 enlisted men were killed in action; 3 officers and 49 enlisted men died of wounds received in action; 1 officer and 158 enlisted men died of disease and 1 officer and 99 enlisted men died while captured by the Confederate forces. There is a history behind each and every man in the regiment. Their lives in Italy, the reasons they left Italy for a new life in America, their lives and the lives of their families, their presences on the battlefields of the Civil War, and if they survived, their lives and the lives of their children afterward. What interesting facts have you unearthed in your research that made you decide to write the book? The predominant details I want your readers to know and use in their studies, research and writing. There were many thousands of Italians and Italian Americans who served in the Union and Confederate armies and predominantly in Louisiana. The information used about Italians in America are now completely outdated and obsolete. With the advantage of using the internet there is much more information about Italians recorded in American history than was previously known or presented to the public; one need only to search on the internet. We all owe a great deal of thanks to the Mormons’ Church of Latter-day Saints, which offers over 16 billion records online that we can search. Their sites are Ancestry.com, RootsWeb, Fold3, Find-a-Grave, the United States Federal Census records from 1790 through 1930, Genealogy.com, and newspapers.com. Other search sites include Chronicling America at the Library of Congress website, and The Civil War Soldiers and Sailors System (CWSS) a database at the National Park Service website. For example just type in the name GIOVANNI and you will be amazed to see all of the men with that name in the database. 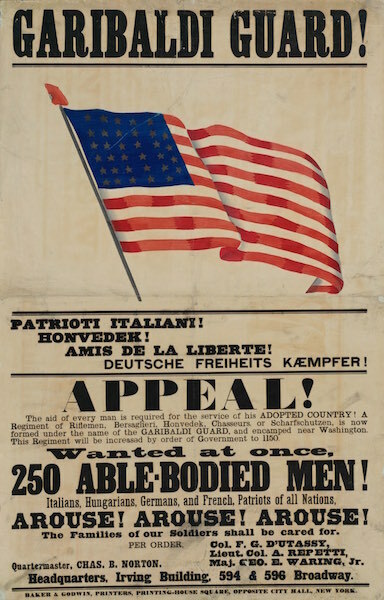 Do you feel that there is a lot more presence of Italians in American history that has really been shown in the past? No, because there has not been support to investigate, research, and write about the lives of Italians throughout American history. I have learned a good deal about the media through my many attempts to publish the book, or to produce it as a motion picture. There is no interest in the Hollywood status quo to change their perception of Italians, so the same images they have always used to portray Italians will continue. Italians and Europeans are history minded and have made the film epics that have presented history. This is why I know that it will have to be the Italian motion picture industry that will produce the historic epics to re-write Italian American history. It will be the Italian and perhaps other European studios who will be producing history events, while American studios are cranking out films about zombies, monsters, crime, space aliens, dinosaurs, and comic book super heroes. Which is why Italians and Italian Americans must begin the task, using the tools I mentioned to write The Comprehensive Book on Italian American History. Are you planning to publish this book in a non-digital fashion in the near future? Did you publish other books prior to this one? Are there any other topics that have popped up in your research that you feel deserve more attention, and eventually another book? There is so much information can be used that writers, historians and genealogists will be very busy looking into all the periods of time in the 17th, 18th and 19th centuries. Before the American Revolution, Italians were coming to French Canada, the Spanish South West and Florida, along the Mississippi River, throughout America’s Southern states, and of course in the cities of the North. There are the alliances between America and Sardinia, Genoa, Venice. And the most notable of all the alliance of America with the Kingdom of the Two Sicilies against the Barbary pirates. This is something we can do, it is all there if you take the time to look for it and write about it. Lincoln’s Foreign Legion: The 39th New York Infantry, The Garibaldi Guard, by Michael Bacarella, Amazon Kindle The Irish and Germans are the two nationalities that spring to mind whenever the subject of immigrants or foreigners serving during the Civil War arises. Most buffs are familiar with the Irish Brigade and the heavily Germanic Union XI Corps, both of which served in the Army of the Potomac. Others can name units and individuals of Irish and German heritage who served on both sides during the conflict. One of the most famous regiments in the North in the early months of the war,however, had its origins elsewhere–in fact,its roots ran back to at least 52 different places–and when its members marched down Broadway in New York City in answer to President Abraham Lincoln’s call for troops, they proudly bore the name of a famous Italian patriot. That regiment was the 39th New York Volunteer Infantry, known familiarly as the Garibaldi Guard. When war broke out in 1861, General Giuseppe Garibaldi was one of the best-known military men on the European continent. As a result, it was Garibaldi’s name that a foreign language tutor to New York’s rich and famous used to recruit a regiment of men from 14 different states and 52 European principalities. The tutor, Frederick George D’Utassy, would be elected colonel of the regiment despite his somewhat shadowy past. 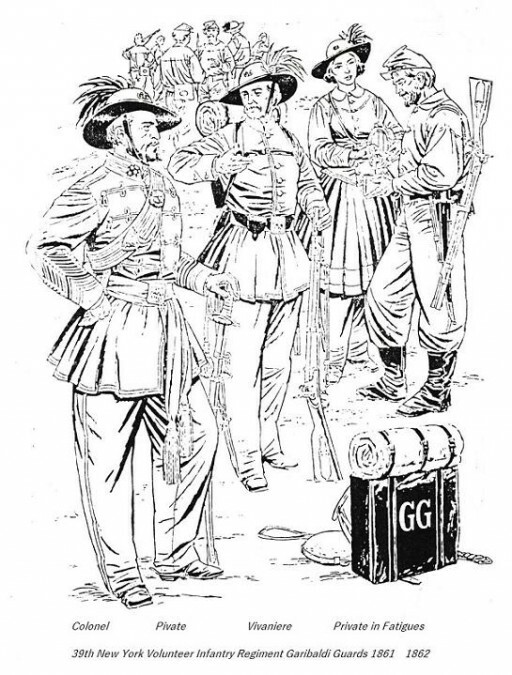 It would not take long for the men of the Garibaldi Guard to realize that they were being commanded by one of the most outrageous, thieving rogues ever to wear the uniform of the Federal armies. Michael Bacarella, author of Lincoln’s Foreign Legion, does a creditable job of detailing the outlandish activities of D’Utassy. The roster of the regiment is also very well-done, giving insight into the many different countries and walks of life from which men came to answer the call to arms during the Civil War. 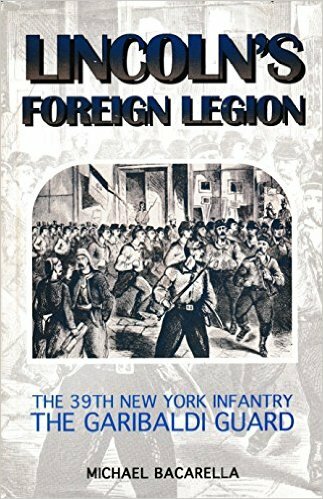 For someone interested in learning more about the role of foreigners during the war, Lincoln’s Foreign Legion: The 39th New York Infantry, The Garibaldi Guard is certainly worth a read. My great-grandfather, Pvt. Herman Holtz was one of the 60 Jewish soldiers in the Garibaldi Guard. 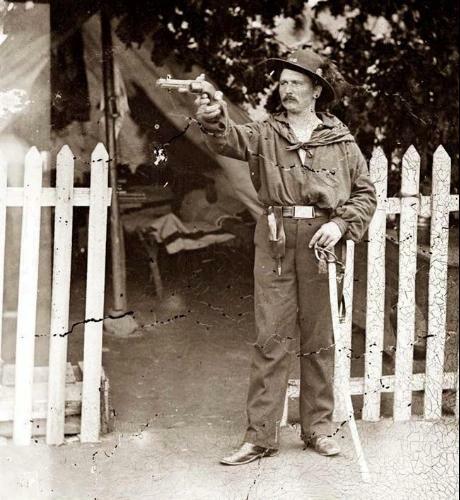 He was in Company K, and was shot in the abdomen at the Battle of the Wilderness on May 6, 1864. He survived. Now his great great grandson is an officer in the US Navy and an elite Rescue Swimmer in Surface Warfare. 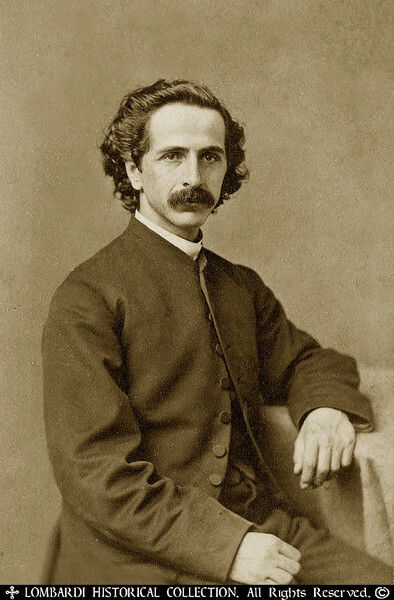 Its Jewish Colonel, Frederick George D'Utassy, was the subject of the most documented case of anti-Semitism contained in primary source material in the Civil War as recently researched by Shapell Manuscript Foundation in Washington, D.C.